The uvex pheos helmet series offers maximum safety and wearer comfort. Regardless, if you are looking for a hard hat, an alpine helmet, a construction helmet with visor or a protective helmet – uvex pheos helmets offer premium protection for many different requirements. 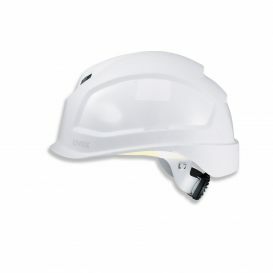 The innovative head protection solution of the uvex pheos hard hat series is compatible with other uvex personal protective equipment (PPE). Eye protection, neck protectors, visors, ear protection, or lamps can be integrated to adapt to your specific safety needs. During the development of the uvex pheos helmet series, a high level of high importance was given to optimal fit and wearer comfort. For this reason, the uvex pheos hard hats use a six-point textile band attachment and suspension harness with wheel ratchet for a variable width adjustment. The uvex pheos helmet is also available in a range of colours and versions. 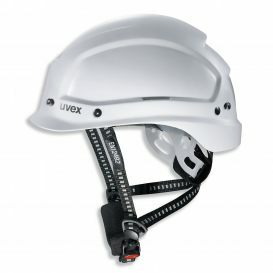 The uvex pheos helmet series always fulfils the highest safety standards. All hard hats fulfil the EN 397 safety norm and additional requirements for very low temperatures (-30 °C), as well as molten metal splash (MM). The uvex pheos alpine multifunctional helmet combines the features of an industrial protection helmet with the requirements for a climbing helmet, with chin straps for use in accordance with EN 12492 and EN 397. Whether to protect against splinters or sparks, when working with noisy machinery or at height, the uvex pheos modular system can be quickly and easily adapted to your workplace environment. Interchangeable components fit perfectly into the ergonomic structure. The visor can be locked above the helmet shell when not required, while the hearing protection can be folded back. Everything fits closely to the helmet and is perfectly balanced - ensuring maximum comfort and freedom of movement. There is no unnecessary weight to strain the muscles on the neck. The joint system is designed to improve the helmets ergonomics and evenly distributes the weight of all attachments across the body's centre of gravity - ensuring it can be worn without causing fatigue. 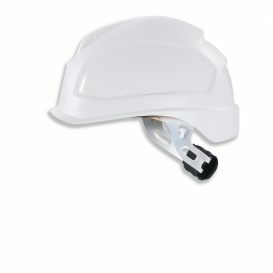 The unique magnetic lock system means parts click together easily - the helmet does not need to be removed when attaching or changing the visor. The anti-fog, scratch resistant, high-quality polycarbonate visor complies with the specifications of the top optical grade and is available as a clear or tinted shade option. The visor fits the helmet seamlessly, leaving no gaps: the injection moulded, transparent peak provides optimum protection in preventing particles penetrating the inside of the visor.